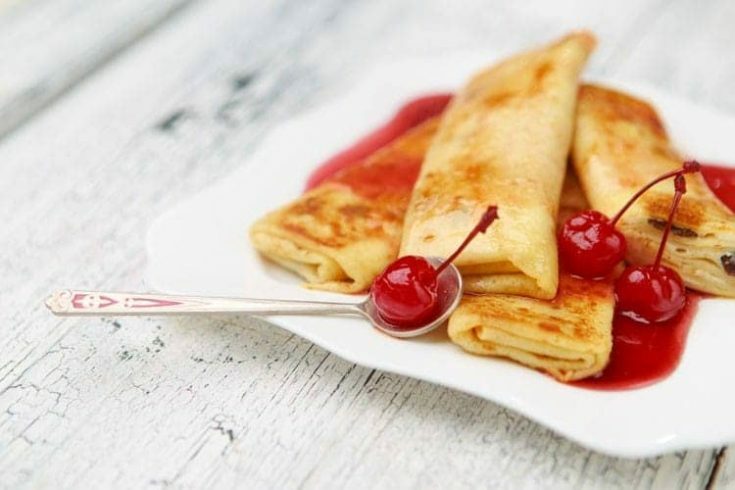 Absolute Best Cherry Crepes Recipe Ever! Just because crepes are typically a breakfast food doesn’t mean you can’t serve Cherry Crepes for dinner–or dessert for that matter! I have to admit, until recently I was never able to successfully make crepes. I know… it’s not that it is a complicated recipe. Really, they are just like a thinner version of a pancake. I’ve tried mixes, recipes, and every time- failure. “Why?” you ask. Well, let me tell you why. It turns out that you are actually supposed to let them cook before you attempt to flip them. Yes. Some recipes like our Chocolate Waffles and Very Berry Waffles you can get away without flipping. Of course, that’s because the waffle iron does all the work and cooks things up on both sides. If only my frying pan could do wonders like that! Then there are my favorite Carrot Pancakes. And yes, those have to be flipped as well. So, liken a crepe to a pancake and flip away. That’s exactly how it is done. It’s just thinner. Don’t hate. It’s just a pancake. Yes, you have to let them cook. I know… who would have thought! Top with your favorite topping… I chose powdered sugar and cherries. Too bad I didn’t have any whipped cream! I’m thinking of all sorts of amazing ways to adapt this recipe and come up with some fab fillings for fall. Pumpkin pie crepes, anyone? Top these delicious crepes with Cherry Pie filling and powdered sugar, or any other number of yummy toppings. Add ingredients in the order listed, beating together eggs and flour with a whisk or in mixer. Slowly add in water so mixture is smooth. Add in sugar and salt and then mix in the melted butter, ensuring that batter is as smooth as possible. Heat skillet over medium low heat and spray lightly with cooking spray. Pour out a small amount of batter and spread it around with a wooden spoon or spatula. You want the crepes to be thin. Lightly cook on each side. The crepe is ready to flip when the top starts to cook (similar to a pancake), and a spatula can slide under the crepe easily. Recipe makes 6-10 crepes depending on size made.